The river Bok Chitto marks the border between the land of Martha Tom’s family—the Choctaw people—and the plantations where the African slaves work in the fields. Sometimes, a slave will escape to the Choctaw side of Bok Chitto and become free. But usually no one crosses from one side of the river to the other. One day, when Martha Tom is looking for blackberries, she ventures across the secret underwater bridge to the plantation side of Bok Chitto where she stumbles upon a slave church meeting and befriends a young slave boy named Little Mo. 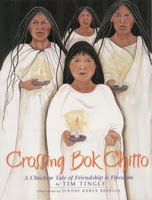 And years later, when Little Mo’s family is in trouble, his friendship with the Choctaw girl will lead them to freedom. This is a sweet story of friendship and freedom by Choctaw author Tim Tingle. A bit text-heavy for preschool storytimes, it would work well as a family read aloud or for use in a K-2 classroom.